My apologize first for not posting any recipes in my blog for a week time. Few personal things pulled me and made me busy these days. I didn't cooked anything special for blog for the past one week because of it. But I have few recipes ready on hand to give a perfect treat. Yes. I have one perfect pizza recipe in my draft for long time. After starting experimenting the yeast baking, I had baked few pizzas at home which included hits and flops. But most of the time, I was not satisfied to post it as a recipe here. After a long time, this one turned out super good as served in pizza shops. After that, I started using this recipe for both base, sauce and changed only topping everytime I make pizzas. Change the topping as per your personal taste and enjoy. 1) In a small bowl, take luke warm water and add yeast and sugar. Mix well till the yeast and sugar dissolves. Let it sit for 7-10 minutes for proving. 2) In a large bowl, take 2 cups of all purpose flour and half teaspoon of salt. Add a tablespoon of olive oil. 3) Add proved yeast. Start adding warm water and make a pliable, sticky dough. 4) Knead it by hand with the help of additional flour(if required) and make a soft dough. If you push it inside using your finger it should spring back at the end of kneading. 5) Make an olive oil coating and keep in the wide bowl. Cover using a cling wrap and place it in a warm place for an hour or until it doubles. 6) After an hour, punch it back and knead again for 5 minutes. 7) Divide the dough into 2 equal parts. Keep aside. 1) When you keep the dough in warm place for raising, start preparing the pizza sauce. 2) Heat olive oil in pan and add onion, garlic and tomato to it. 3) Saute till all the ingredients are soft and mussy. Turn the flame off. 4) Allow it to cool this mixture to room temperature and grind it to a smooth paste. 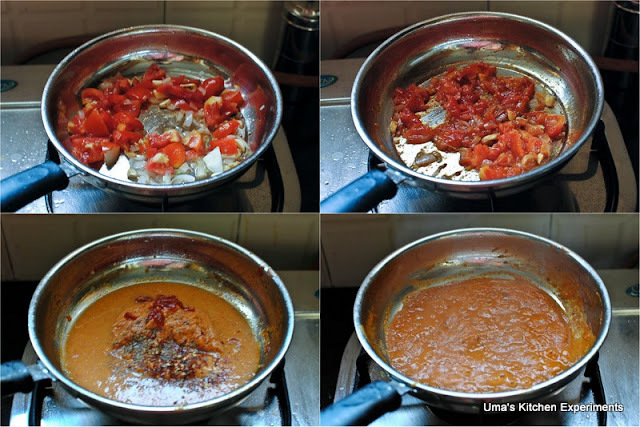 5) Reheat the ground paste along with salt, red chilli flakes, tomato sauce and oregano. 6) Turn it off when it slightly thickens. Allow it to cool to room temperature before apply to the base. 1) If you have pizza stone use it for making the pizza by spreading the corn meal on top of it.Otherwise, use a baking tray. Spread a butter paper / parchment paper on baking tray. Spray cooking oil on top of it. Preheat the oven to 200C(392F) for 15 minutes. 2) Meanwhile, Take one ball of dough and flatten it using your hand on floured surface. Stating from center to outside, use your fingertips to make 1/2 inch thick base. 3) Place this base carefully on the baking tray. Pierce it using a fork. 4) Apply a coating of tomato sauce. I used 2 tablespoons for a single pizza base. 5) Sprinkle processed cheese slightly. Approximately 2 tablespoons for each pizza. 6) Arrange the vegetables as per your choice. 7) Arrange Mozzarella cheese on top of it. I used sliced mozzarella cheese instead of shredded one. 8) Sprinkle oregano and bake it in the oven for 7-10 minutes or until the crust turns golden brown and cheese turns slightly golden brown. 9) Take out from the oven and cut into slices. 10) If required, sprinkle red chilli flakes and black pepper powder. Enjoy. 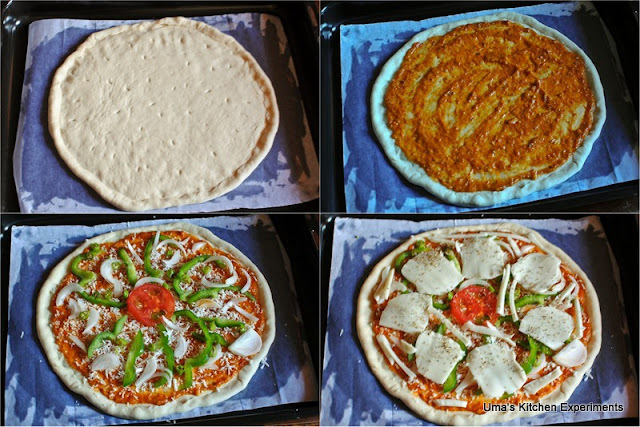 1) I used Amul Mozzarella Cheese and Amul processed cheese for making this pizza. 2) Use any of your favourite vegetables for topping. It is absolutely your choice. 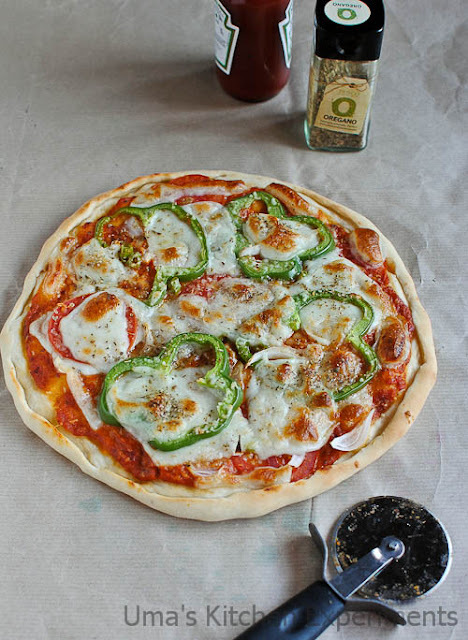 3) Apply a coating for olive oil on the surface of dough, to avoid sogginess due to vegetable topping. It is optional. 4) Oven baking time might vary based on the oven model. So Keep on eye while the pizza is in the oven. wonderful prep.. i am lovong it..
Looks delicious! I too made pizza for Sunday dinner! 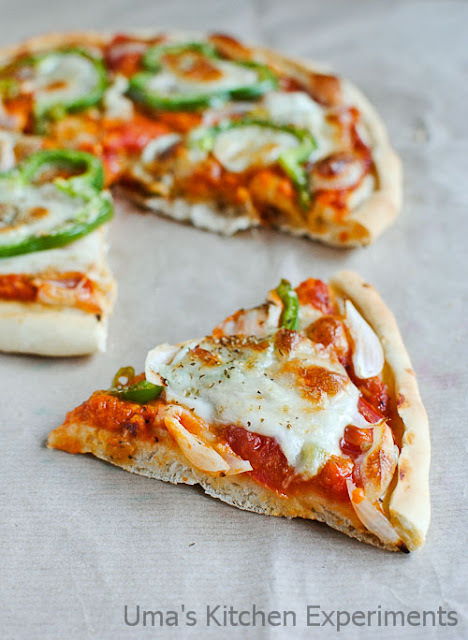 I hardly says no to these much irresistible pizza, even its with just veggies, loving those slices. 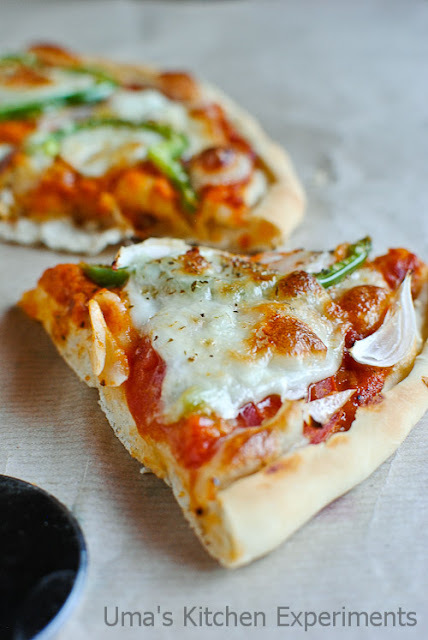 so fresh and flavorful homemade pizza...looks too delicious n tempting. 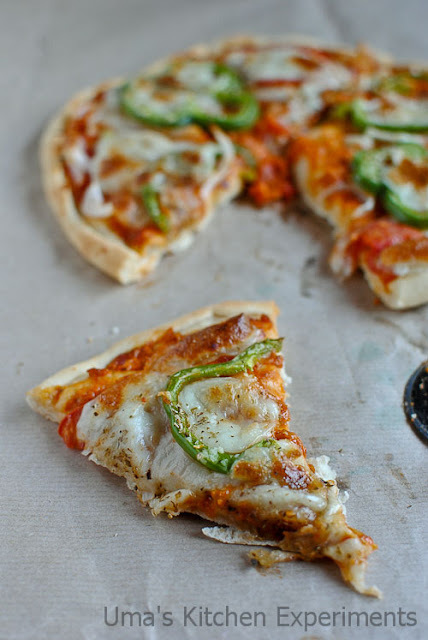 Pizza looks fresh, yummy and perfect! lovely one Esp i loved the topping ! wow ! great effort ! 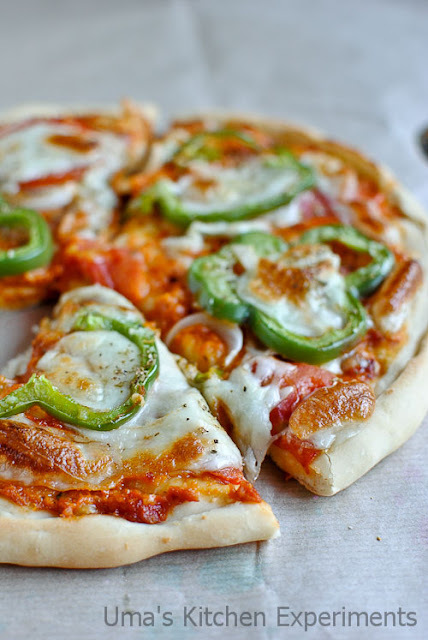 Pizza looks so perfect.. Delicious and colorful..
That's one great looking pizza...eventhough I make pizzas ,my clicks always looks boring,so never posted it,this looks so tempting too..
Hi Uma, i'm a newbie to food blog and your Pizza seriously took me all the way to see your blog.. Nice clicks.. I want to check all other posts and pictures too..